A leading disability charity is calling for a "radical rethink" of government programmes aimed at helping disabled people find paid work. 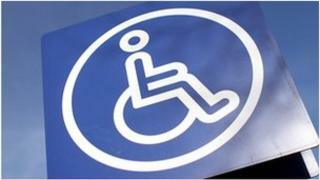 Disability Rights UK, which campaigns for disabled peoples' rights, says the current support programmes are "failing" people with disabilities. It found 63% of those it surveyed said the government support they received did not help them get a job. And it said a majority wanted more say over the nature of the support given. "Cutting out the middleman of employment support - under the guise of the Work Programme and Work Choice - provides a better deal to the taxpayer," said Liz Sayce, chief executive of Disability Rights UK. Currently the government has two programmes - The Work Programme and Work Choice - both aimed at helping people with disabilities find paid employment. However, Disability Rights UK said its research of more than 500 disabled people in August, found a mismatch between the support provided and the help disabled job hunters wanted. Overall, 60% of respondents said they would like individualised employment plans, but just 36% of those surveyed had one. "The Work Programme is a non-work programme - at best it is heading for an 88% failure rate with people on out of work disability benefits," added Ms Sayce. A spokesman for the DWP said: "Previous schemes didn't do enough for disabled people and those on sickness benefits, which is why we introduced the Work Programme to give tailored support to address individual barriers to work. "Thousands of the most hardest to help people have already found lasting work through the scheme. "More generally, we have protected the budget for disability employment services and recently kick-started a two-year advertising campaign to support business to become more confident at recruiting disabled people, as sometimes employer attitudes can be a barrier to work." After the Paralympics: Has anything changed for disabled people?